Here's my second installation of quilting and sewing bloggers to watch in 2010! You can see part 1 here. Sarah makes wonderful bright quilts with lots of free piecing. I love her wonky quilt houses. Sister Diane of Craftypod has a great podcast and has published several craft and craft blogging ebooks recently. Nanette and her daughters post about great quilt projects and beautiful fabric. Craftzine is updated several times a day with the latest ideas and projects from the craft blogosphere. 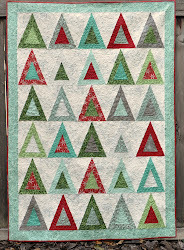 I love all the bright red, white, and blues in the crafts that Corry shares on her blog. Kristin makes a cool zine and also blogs about all things related to living a craft-filled life.She writes patterns (knitting, sewing, weaving, and more) for her zine and gives some of them away for free, too. Audrie has been quilting for less than a year and she makes lots of sweet quilts. She's funny, too! Now here is a different perspective from a lot of the quilting blogs out there... I appreciate Jude's "slow cloth" approach and the food for thought her writing and photography provides. This is a beautiful blog; Elizabeth has done several gorgeous quilt tutorials and sells some of her patterns too. All fabric news, all the time! I love this site! Lots of inspiring projects, fun things to do with kids. This blog has great, classic sewing and pattern drafting instruction; the author, LiEr, did a series on girls' skirts last summer and is finishing up a series of how to draft jumper style dresses for girls right now. I'd love to hear about your favorite sewing or quilting bloggers--share them in the comments or post about them on your own blog! Thanks for sharing. Always fun to find new inspirational blogs! Thank you so much for including me in your wonderful list! I am honored to be among such talent! Great list! Some blogs here that I haven't visited in a while! Thanks for the reminder!